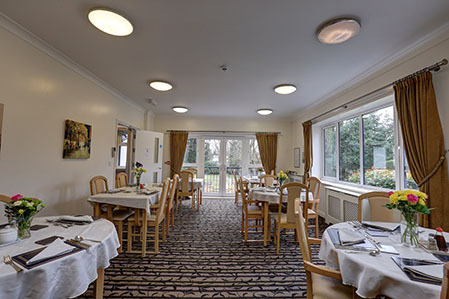 Our spacious and tastefully decorated dining room is situated on the ground floor and provides ample space for our 23 residents. Prior to joining us, we discuss specific dietary preferences, including specific likes and dislikes and any special needs such as diabetic, high calorie or low residue menus, each of which can be catered for by our chefs. At Southfield we pride ourselves on producing freshly cooked appetising meals. Our experienced chefs provide a balanced, interesting, varied and nutritional menu, prepared in house on a daily basis, using fresh and locally produced ingredients, whenever possible. Specific requests are met and alternatives provided. 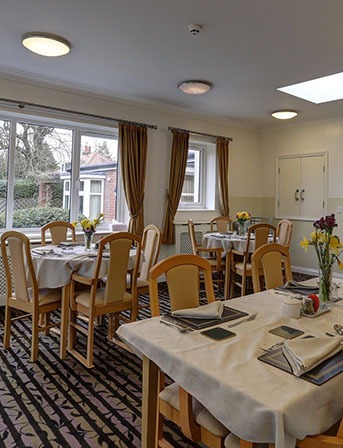 All meal times are flexible and residents can arrange to have their meals in their own rooms or in the dining room. 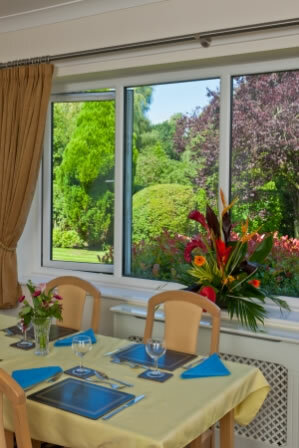 Residents are encouraged to invite visitors to join them for breakfast, lunch or tea. These can be made available for a small charge, providing advanced notice is given. Although our menus change daily, you can view a week’s ‘typical ’ lunch menus by clicking here. Breakfast:	Between 7.00am & 9.30am.